Blood Sucking Chupacabras, Mutants, and Mangy Coyotes- Oh My! East Texas- The mythical blood-sucking beast from Mexico known as the chupacabra has been roaming the Pineywoods since 2004. Some say the hideous vampire beast is nothing more than a mangy coyote. Others think the beast is a mutant result from the 2003 Space Shuttle Columbia crash that slung debris across East Texas. Still, others contend the hairless creature is a hybrid canine, as the result of breeding among feral dogs and coyotes. The difference in this East Texas legend and other mysteries that have eluded area residents and scientists for years is the hard evidence that proves there is an ugly, hairless, dog-like critter meandering about. People in the Pineywoods have embraced the chupacabra oddity and often joke about it. Last week a sign went up in Crockett that turned heads and had other scratching thier head. 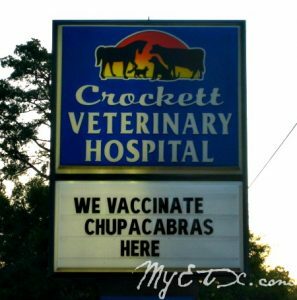 Its vaccination time again in Houston County and apparently Crockett Veterinary Hospital will vaccinate just about anything. Even a chupacabra! Since 2004, when Pollok area residents shot and killed a hairless, four-legged canine creature under their house, reports of chupacabra sightings have been a regular occurrence in the Pineywoods. The Mexican legend of the chupacabra has only been circulating for about 15 years, and is believed to originated in Puerto Rico. Most people who get a look at the bald beast describe the animal as having blue-gray skin, almost hairless, with mange; a large over bite, giving the animal a rat-faced appearance with extremely long canine teeth; smaller front legs than hind legs, and as having a tail similar to a rat. Some say the ghoulish creature looks like the living dead; a canine zombie. Mange, also known as sarcoptes scabiei, is a popular explanation used to explain away the grotesque beast commonly seen throughout the state. In humans and nonhuman animals alike, is a condition where mites burrow under the skin of its host and secrete eggs and waste material, thus triggering an inflammatory response from the immune system. Such an infestation can be life threatening for canines such as coyotes, which haven’t evolved especially effective reactions to sarcoptes infection. Some scientists are suggest parasites created the chupacabra, transforming canines into the very goat suckers who are on the prowl. East Texans aren’t sure about what exactly the animal is, but some people suspect a mutation occurred after the 2003 space shuttle crash. A ranch manager in Eastern Anderson County said he never saw “anything like it until the space shuttle crashed.” Since the crash the rancher claims he has seen three chupacabras, which he believes are mutants. “I’ve seen plenty of mangy coyotes in my day but none that ever looked that bad,” he said. Mexican folklore has passed down the legend of the chupacabra in several forms. Most popular are the lizard-like being description and the hairless dog description which is commonly reported in Texas as well. In Mexican culture the lizard-like chupracabra is said to have leathery or scaly, greenish-gray skin and sharp spines running down its back. The creature is said to be approximately three to four feet tall and hops like a kangaroo. This Mexican monster has been described as having a panther or dog-like face with large teeth, and a long, forked tongue. The beast is said to hiss and screech when angry or alarmed. The word “chupacabra” literally means goat sucker. The creature so often spotted in Mexico and Texas is credited with sucking the blood of livestock, especially goats. The growing legend of the chupacabra has sparked interest among trained zoologists and amateur enthusiasts. The chupacabra oddity falls third into the realm of cryptozoology, right behind the two most famous cryptid creatures Bigfoot and Loch Ness. Reports from witnesses who helped with the Pollok creature’s autopsy revealed gruesome details about the creature being called a chupacabra. One woman said there was almost no blood seeping from the gun shot entry wound on the animal and the tissue appeared rotted and necrotic.” The woman told reporters in Lufkin the creature’s ear “broke like a cookie” when its head was moved for a photo and resembled the carcass of an animal that had been dead for at least a month. Several Houston County residents say they witnessed the hideous creature in 2007. The group said they were at a house located East of Grapeland when the decrepit critter moseyed up. They had all heard tales of the chupacabra but no one in the group had ever seen one before. They said it walked into the yard slowly and sniffed around for awhile. One member of the group left the area to get a gun because they were not sure of the animal would attack them or other animals on the property. While he was away the creature left the yard just as slowly as it had entered and was never seen again. The group’s description of the creature was consistent with the gray, hairless, dog-like creature with shorter front legs than hind legs, and a rat-like tail. “We just sat there and stared at each other and it (the creature). I don’t think any of us knew what to say. We had all heard of chupacabras and about the sightings in East Texas,” said the spokesperson for the group. Not all of the group would label the creature a chupacabra, and one referred to it as a mangy coyote. But one thing the group seemed to agree on is just how hideous-looking the creature was. “That was the ugliest thing I have ever seen,” the spokesperson said, as the rest of the group nodded in agreement. Chupacabra sightings have taken place in some of the most remote settings in East Texas, but within highly traveled areas are not strangers to sightings. In recent years, one of the creatures was spotted in a Nacogdoches neighborhood, in a resident’s back yard. East Texans have yet to report an attack on a human by a chupacabra, the blood sucking, vampire beast. However, East Texas residents say the creature is reportedly fond of goats, chickens and other small animals. Sightings of the creature happen on a fairly regular basis, although not all sightings get reported to Texas Parks and Wildlife. It appears that East Texans are getting used to seeing the creatures, despite the fact there is no official explanation for the creature’s existence or demise, however you might view it. If you or someone you know has seen a creature that resembles the description of a chupacabra please contact our team at MYETX.com. We are always interested in the strange and unusual in East Texas and want to see your photos and videos and hear your reports. Email us your reports, sightings, photos and videos to myetx.team@gmail.com! March has definitely came in like a lion and that means Spring Break is just around the corner. 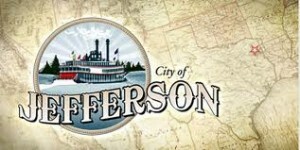 Jefferson, Texas is a fantastic destination for families during Spring Break. 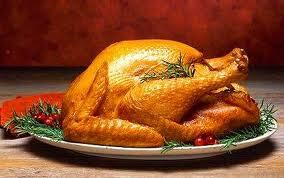 Turkey is the star of the Thanksgiving show, but if you have never cooked a bird you might be hesitant to undertake the main course. Don’t be intimidated by the mighty bird! MYETX will help you conquer it.